This week I took a trip to Hatfield House, the childhood home of Queen Elizabeth the first and the place where she found out that she would become queen. 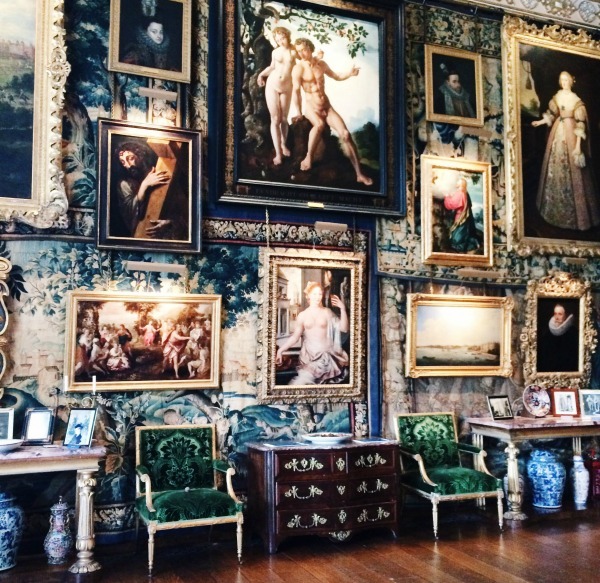 I only live about fifteen minutes drive away and although I've been to lots of events in the grounds over the past few years, I haven't been inside the house for more than ten years so I was definitely due a trip! The old Tudor palace where Queen Elizabeth used to live is now a modest building in the grounds as some of it was demolished and the bricks were used to build the bigger, Jacobean house where the Cecil family have lived since the 1600's. The house itself is full of beautiful paintings and artifacts. I'm a little bit of a history nut so I was really excited to get a better look at the rainbow portrait of Queen Elizabeth in the Marble Hall having watched a program about it. It's full of hidden symbols and meanings and really worth a read about if you have time! There are also guides in each room to fill you in on any unanswered questions (shout out to Dermot in the library who was a mine of helpful information!). My favourite rooms were the Long Gallery and the Amoury as they were not only beautiful to look at but really felt like a step back in time. The gardens were what I remember most vividly from my visit to Hatfield House many years ago. They switch from looking grand and stately to an almost countryside feel depending on where you stand. I love the lime walk that surrounds the west garden, the variety of flowers and the fountain in the middle of it all. It felt very peaceful and fitting with the period of the house. The fountain at the front of the house is a fairly new addition. Unveiled in 2015, the sculpture was created by Angela Conner and features moving parts which make it very dramatic to observe. Located around a really pretty courtyard, the stable yard is home to a variety of shops and places to eat. You can visit free of charge and throughout the year a number of events take place from busking to beer festivals. I'll definitely be taking note of when they are as the location is absolutely beautiful. Have you visited Hatfield House before? Wow, breathtaking location! Lacky you! Wow what a great place! I had never heard of it before. Wow!Look at all these vintage, antique goodness around. And that garden will be a great romantic stroll for lovers. Ha! OMG this place is amazing :o nice recaps and thanks for sharing! This seems amazing dear! Lovely images. Wow, this is the childhood home of the Queen and you live in only 15 minutes distance from it? Thanks for sharing this interesting post - I love especially the garden! Really gorgeous!!! Wonderful pics Rosanna! I've never been before but I love visiting places like this, it looks gorgeous! It's so nice that the same family has owned it all that time! Oh wow, what a stunning location! This place is absolutely up my street, and especially as there's such a lovely garden there too :) Thanks for sharing this, it's sooo beautiful! This place is gorgeous! every corner is so pretty. I love historical architecture they are always so fun to go to and they are full with beautiful symbols. Thanks for sharing. Wow, this place looks so interesting! I'm loving the beautiful garden...it looks majestic! WOW This place is amazing, great photos! My favorite is the garden, so green and in exquisite shape.